The market action on the last two days of this week was not kind to equity investors. The Dow Jones Industrial Average closed down 530 points today and closed the week in correction territory, i.e., down 10% from its May high. The S&P 500 Index has not reached correction territory though, down 7.5% from its closing high on May 21st. The pullback this week in the S&P 500 Index and the Dow has resulted in oversold market conditions that historically have resulted in a subsequent market bounce. 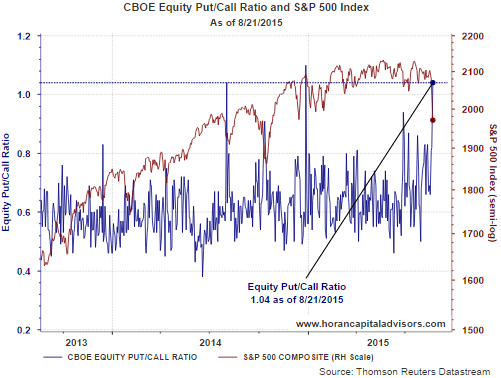 The equity put/call ratio closed today at 1.04 and levels above one are indicative of overly bearish market sentiment. The equity P/C ratio tends to measure the sentiment of the individual investor by dividing put volume by call volume. At the extremes, this particular measure is a contrarian one; hence, P/C ratios above 1.0 signal overly bearish sentiment from the individual investor. This indicator's average over the last 5-years is approximately .635 indicating the individual investor has been generally mostly bullish and more active on the call volume side. 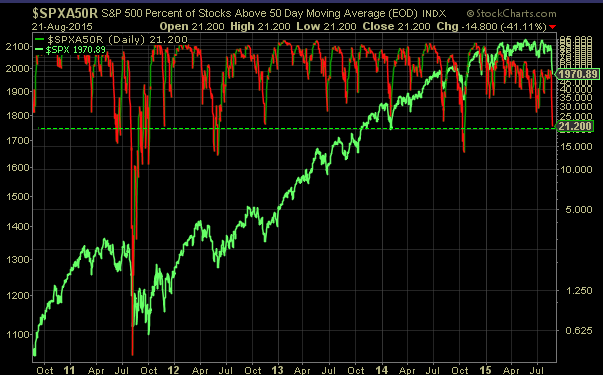 Another indication the market is oversold is the percentage of stocks trading above their 50 and 200 day moving averages. 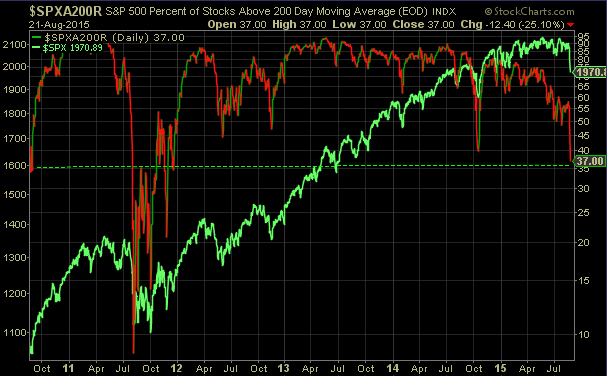 Both of these measures show the extent of the weakness in the market. The 200 day moving average is approaching levels last reached during the fiscal cliff period/sell off in the later half of 2012. We noted in articles in April and May of this year that those smaller pullbacks at that time were not likely the beginning of a correction. 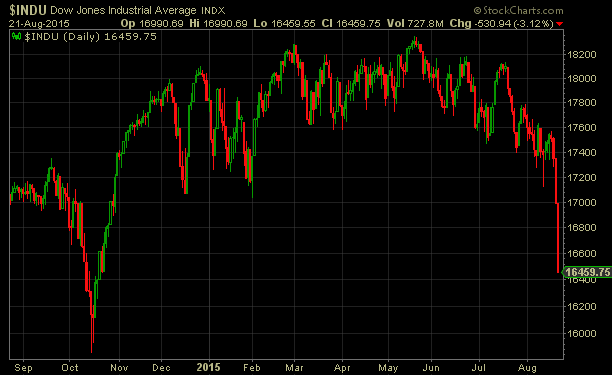 Activity this week certainly qualifies for that correction. The dog days of summer are now showing their colors. The question for investors is whether this pullback is one that will extend into a bear market, i.e., down 20%. This is difficult to predict; however, we do believe economic activity in the U.S. and in developed markets outside the U.S. continue to show growth, albeit slow. The weakness seen in emerging markets along with their currency depreciation policies, certainly are of concern. We do not believe a full blown currency war occurs as this will benefit no country. Japan's growth has fallen below expectations and this is in spite of a massive QE program being pursued by the Bank of Japan. From an economic cycle perspective it has been some time that the U.S. economic cycle has been out of sync with foreign economies. The Fed wants to increase rates if for no other reason than to have fire power available if needed down the road. Many developed overseas markets, especially the euro zone, have just recently embarked on a QE strategy in an effort to stimulate growth. This will keep euro zone interest rates down at a time the Fed is trying to move our rates higher. This would result in a further strengthening of the US Dollar versus the Euro. A strengthening Dollar will continue to pressure multinational company earnings/sales. The laser focus on the Fed's rate policy is also creating market uncertainty. We do not see specific economic data points that suggest the Fed should increase rates. The corner the Fed is in at the moment is the fact rates should have never been left this low for this long. The sooner the rate increase occurs, probably the better for the market looking 12-months out. The sideways action for the markets for the better part of this year has culminated in quite a bit of technical damage to a broad basket of stocks and the indices themselves. Repairing this technical damage does not occur overnight. On the other hand, many individual stocks are in bear market territory and maybe this week's market action provides an opportunity to begin deploying excess cash. It is difficult to predict market bottoms though.